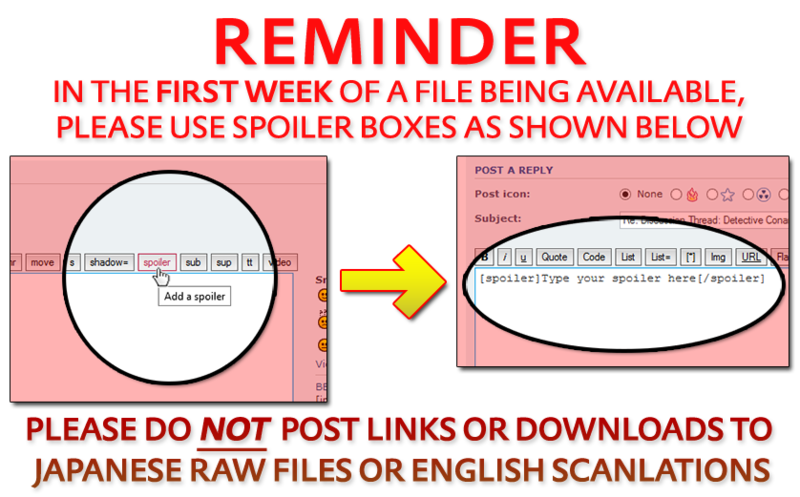 As stated in the above image, please continue to use spoiler boxes for the first three days in which a file is available. However, due to legal restrictions, we kindly ask that you do NOT post any links in this topic to any Japanese raw files or English scanlations. For more information on this matter, please click here. 1,032 spoiler pics are now out. DBs, Kobayashi and Rumi (and rest of class) go to Gunma Prefecture to pick up wild vegetables, But there might be some trouble there..."
As the spoiler pictures have come out I think I can take the liberty to share my thoughts. We got a panel of Rumi with Kohji case info. We also got the "scent of blood." , now from the scent of blood and the picture it is clear that blood had come out of the victim's mouth. Which indicates severe internal injury. So this is suggestive that APTX was not used, rather brute force was used. Plus Kuroda's flashback lacks that pool of blood. A dying message is only left if the victim can identify the culprit uniquely. So the victim named his killer. So there are obvious reasons about why the mirror message and the shogi piece message weren't written by the same person. a) Firstly the victim needed to have a huge amount of time, he had to lock out his assailant, create the mirror message, then hide it, then the assailant breaks in, fights with him and the victim dies with the shogi piece and scissors. It sounds plain rubbish as in this scenario he needs to drop his scissors, grab the shogi piece and then again pick the scissors up. Which is just plain gibberish. b) The mirror as of now has no hints of being handled by Kohji but Kohji had handled the scissors and the shogi piece. The dying message is the shogi piece with scissors. Now given the defensive grip of the scissors, it looks like a dagger axe and if the fist is opened, the scissors look like the Kanji Ka. Dagger axe is also called Ka. So the message is Katsumata. Rumi cleaned up the scene and took the shogi piece. But why she did it? One easy answer is that the corpse in Kuroda's memory looks like one who had been beaten up and then was possibly forced a poison/APTX but the corpse in Rumi's memory looks like one to be beaten to death. So that clean up helped Rum to take credit of the killing and thus sparing her the hassle of finding the other one aka Kohji killer. I think someone else possibly Tsutomu came after Rumi had left, he created the mirror message because he thought that Karasuma group was behind the attack. a) Given Mary had warned her sister and Atsushi about KG and Tsutomu still operating at that time sort of implies that it was told by Tsutomu. b) Tsutomu came to Japan from UK 19 years ago with his family, much before the Kohji case, plus Tsutomu was involved n it plus he knew KG was shady. Which indicates possible infiltration, which is further hinted by the demon in darkness and Tsutomu meeting with Mary at London after he was declared legally dead. So Tsutomu had seen that the dying message was stolen and a cleanup was done, so he created the mirror message which had implicated the Karasuma group but while doing so he had left his fingerprint. In current time possibly Kuroda/Amuro during the last case tried to match Wakita's fingerprint with the one which they had lifted from the crime scene. Rumi=Rum, the one who cleaned up the scene to take credit of the murder so that she doesn't have to look for the original killer but had the shogi piece with her, if it went downhill/she got blackmailed by the real killer she can sniff him out and kill him. Plus she also wants to lure out the one who had written the dying message by using the same name. because that person might be a threat to BO. Kuroda= An indirect player, came much later to the scene. Is not the one who had written the message, if that was the case then he would have known her plan much earlier. Wakita= The one who had written the message, is hiding his height because in near future we will see a Wakita version 2 , who will be taller, slimmer,with a completely different face and work with a name/no name. You have one little mistake, Zerozaki. The kanji for dagger / sword 刀 isn't read as "ka", It's either "katana", "sori", or "tou". I was using the kanji of dagger axe/Pyke etc. I'll get the link at once. Zerozaki4869 wrote: As the spoiler pictures have come out I think I can take the liberty to share my thoughts. That Rum/Rumi killed Amanda Hughes... while, at the same time, Chikara Katsumata killed Kōji Haneda—two separate murders by two separate culprits. After killing Amanda, Rum/Rumi then came upon Kōji's corpse and altered the scene to make it look like what happened in that hotel was two murders by one culprit, and took the shogi piece that pointed to Katsumata as the killer. Does the BO Boss know that she didn't actually kill Kōji Haneda? Does the BO Boss or anyone else in the BO know this truth? Tsutomu then came upon the scene, assumed that the BO had killed both Amanda and Kōji, and to point people in this direction, created a fake dying message to implicate the Karasuma Group as the one behind the murders... only to leave a trace of himself behind—his fingerprints. 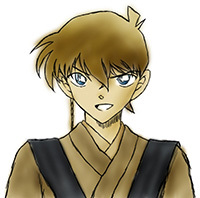 Finally, Hyōe showed up to the scene even later, and was also deceived by Rum's altering of the scene into thinking that Kōji's killer and Amanda's killer were one in the same person. He also collected Tsutomu's fingerprint from the scene. Why would Chikara kill Kouji? And also in the Unted States? Killing a rival in chess? But why this far away from home? "During the betrayal series(File 954-957) Vermouth's actions suggested that she wanted to get involved in Bourbon's mission in order to investigate Kohji's dying message. The first indication was the fact that she unnecessarily offered her blackmailer to help with a disguise(which naturally includes getting involved in the mission in order to oversee the disguise, like in File 852), when he could just force it from her if he really needed to(File 954). The second indication is the fact that she still involved herself in Bourbon's mission, with a rushed disguise of Asuza, despite the fact that Bourbon was enough for the job(File 955). There's therefore a possibility that she involved herself because she was personally interested in the dying message that involves "ASACA""
And... strangely enough Mary and Gin seem to have the same black eye-shade and use the same quote. a) I think Rumi did it to hide the fact that there is one more player who might have seen her but can't come out for obvious reasons, but the nervous nature of BO might have put her into a disadvantage. She knows that it is not a big problem but enough to warrant a headache. To get rid of it she took the second murder on herself, possibly she also wanted to kill Kohji as Kohji was possibly an witness of some sorts. b) I don't think it is in BO's domain. As for Vermouth's interest in Asaca, it is purely to keep Bourbon in check so that he can't harm her treasures. Had it been the case then "Vermouth" would have shown more interest in the Kohji case uploader. Last edited by Zerozaki4869 on April 7th, 2019, 11:12 pm, edited 1 time in total. I always took that case suspects as foreshadowing of Rum suspects. was it just me or is this Conan series getting more and more DIRECT? Now the culprit is being exposed even before the case is closed! On a side note, Kohji being bruised all over as if being beaten to\before death makes completely no sense to me. It's lame if someone has to get in a physical struggle fighting a shogi player of weak physique and landing multiple hits on him while failing to make a knock-out or fatal kill, which simply shows that Kohji's assaulter is a really weak fighter. Otherwise, the only other reason i can think of for Kohji having bruises all over is being tortured or interrogated for information or something that he could be holding on and hiding. Recall that Amanda's room was neat and tidy, while Kohji's room was in complete mess? Could be the result of a bizarre fight between Kohji with another weak fighter or it could be done by someone who was trashing his room while searching for something. blackmoon wrote: was it just me or is this Conan series getting more and more DIRECT? Now the culprit is being exposed even before the case is closed! It is more in line with the set-up. The sole reason for this case is to foreshadow Rumi's motivation for taking the shogi piece and wiping the blood. Now the person who had attacked Kohji by no means was weak but a lousy fighter at best. If Kohji is vomiting blood then chances are that APTX won't work and when someone coughs up blood after an injury it is literally a fatal injury. So to use APTX we have seen the standard procedure, knock the target out and then make him swallow the capsule. This couldn't have been done if Haneda was coughing blood. Given these many defensive wounds on Kohji's body/face, we can concur that the thrashing happened when the assailant and the victim was fighting tooth and nail. There have been plenty of cases where we knew the culprit(s) from the start, and Conan has to figure out how they did it. So it's nothing about "getting more direct". Just that this case is one of those types of cases. What did Conan notice when looking at the killer’s hands? Is it that she didn’t take off her ring eventhough she was going to search all over the dirt? Or maybe that one of the hands was clean despite that she's supposedly been digging the ground to find the earring. The trick obviously involves the cardboards in the car to block the passenger's sight of the right side of the car so that they can't the body. Somehow, the culprit made the car displace without the others noticing to expose the body and make it look like someone just left it there.